On Monday of last week there was a conference in London for central bankers, commercial bankers, members of academia and hedge fund managers, organised by a number of research groups and designed to accommodate dialogue between the investment industry and the movers of monetary policy. 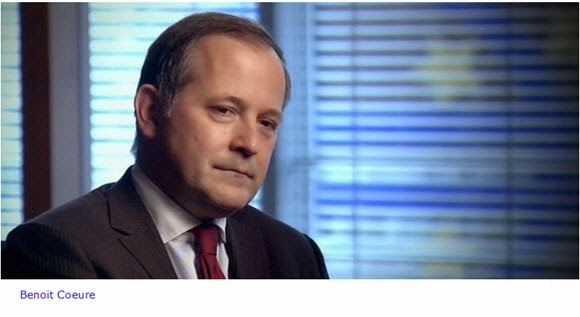 Benoit Coeure (pictured), executive board member of the ECB, gave a speech in which he outlined the central bank’s plans to accelerate its bond buying program under Eurozone Quantitative Easing, in order to anticipate any lack of bond market liquidity that might arise during the Summer months. This practice has been described as “front loading” the QE process. Such a measure could be expected to lower the value of the Euro, and indeed it did when the London session opened the following morning. The problem is that the speech was embargoed until the following day and in the meantime, the privileged few fund managers who had been present at the speech had information that no one else in the market was in possession of. Predictably, there was uproar among Forex traders as a result. Both the Wall Street Journal and Bloomberg gave the matter prominence, to the embarrassment of the ECB. As a consequence of this, the central bank has announced that it will no longer follow the practice of placing a press embargo on the text of such speeches, and will allow them to be released immediately they are delivered in the future. A free and aggressive press has once again demonstrated its value in preserving a level playing field for all participants in the Forex and other markets.